A-1 Automotive is a full service Automotive shop. We can test drive, diagnose and adress all of your suspension needs. First of all let’s talk about shocks and struts. What is the difference? Shocks in most cases do not carry the weight of the vehicle. The do dampen the bounce of the vehicle as it travels over rough terrain. Strut on the other hand do in most cases carry the weight of the vehicle. It is made up of three components, the strut or dampening part, the coil spring which carries the weight of the car and the upper strut mount which is the pivot point of the strut so the vehicle can steer. 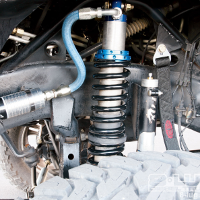 There are air suspensions and electronic suspensions that all involve shocks and struts. There is also electronic suspensions that are controlled by your vehicles computer systems. A-1 Automotive would love to serve you for all of your suspension needs.